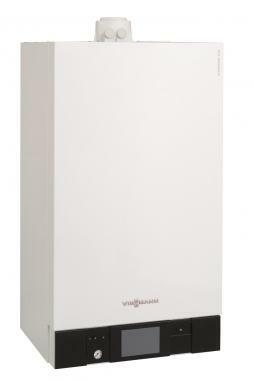 The B2HB Vitodens 200-w boiler is a system gas boiler by Viessmann. It is wall mounted and condensing. This is a highly reliable unit, being quiet in operation with its low fan speed. It’s easy to operate with it coming with a vitotronic control unit that has a 5 inch colour touchscreen and is able to be controlled via app and internet when used in conjunction with the Vitoconnect 100 WLAN adaptor. 98% of the fuel being used is converted into heat and in can have a boiler cascade with up to six boilers (up to 594 kW). This boiler is an B rated model with it having an efficiency rating of 89.2%, as well as it having an output of 35kW, with this range being available in both combi and system you can be sure there will be a boiler to fit you and your homes needs. With it being a compact boiler, with the sizing being only 450mm wide (1.8 to 35kW), you can be sure this boiler will be able to fit anywhere. This model also comes with a warranty of 3-5 years giving you that added security that you have bought a reliable boiler.